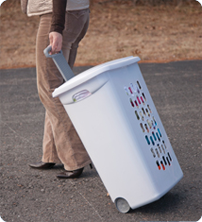 The Ultra™ Wheeled Hamper offers smooth gliding wheels and a retractable handle that pulls out to easily transport clothes to and from the laundry room making laundry day less of a chore. The Flip-top lid helps to keep your contents contained and concealed, and the hole pattern allows clothes to remain ventilated and reduce excessive odors. Its durable construction and reinforced rim are designed to hold up to regular day-to-day use. The smooth plastic interior is snag proof and easy to clean and the integrated handles on each side allow the hamper to be carried if desired. 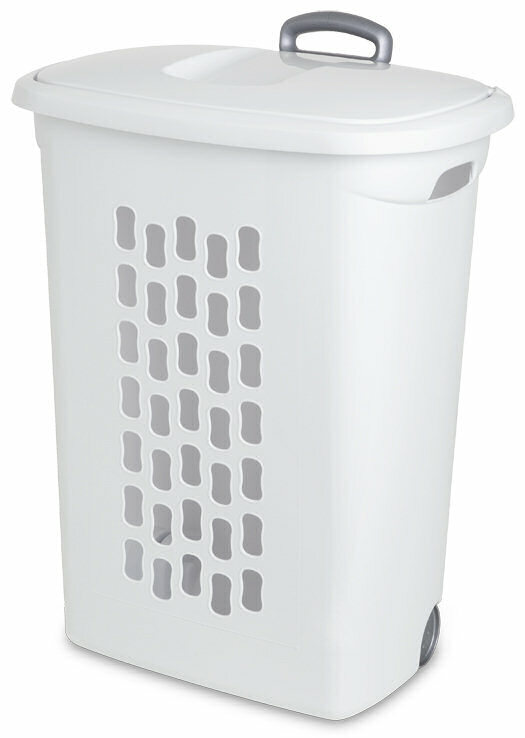 This Hamper is ideal for storing dirty clothes, transporting laundry or sorting loads. The overall dimensions of this item are 21" L x 13 3/4" W x 28 3/8" H.
Overall Assembled Size: 21" x 13 3/4" x 28 3/8"
Easily transport clothes to and from the laundromat. Ultra Wheeled Hamper is rated 4.6 out of 5 by 38. Rated 5 out of 5 by Connie67 from This hamper makes carrying laundry to and from much easier to handle. Love the handle that hides-away, so it don't get broke. Makes many other tasks that require toting around simpler and all on hand. Deep enough to hold quite a load. Rated 5 out of 5 by TracyAn from Love this I actually use this hamper for my recyclables. It's a perfect size. I just fill, wheel it to my condo recycle bins and dump! Rated 1 out of 5 by AmeliaS from Falls Over CONSTANTLY I regret buying this Poorly designed piece of junk. It is completely useless. It falls over constantly. When it’s empty, when it is full. It doesn’t matter; the only time it stands up is if it is leaning against a wall. The reason it falls over is because the bottom of the hamper is more narrow than the top, making it top-heavy. I should have realized how awful the design was as I waited in line to buy this thing, and it feel over when I took it out of my cart. I REALLY wish I could return this. I contacted customer service and they told me “Thank you for the feedback.” I am not buying anymore products from this brand. Rated 5 out of 5 by aagner5622 from Awesome Hamper I absolutely love this three pack of mobile laundry baskets. I had one before and I have used it so much I worn the wheels. This set is perfect. The handle slides up and down, and the wheels help tremendously when I need to either go to the laundry matt. It fits 2 loads of clothes with ease. Well I use commercial washing mashines, I am able to fill two washing machines with the amount of clothing these hold. I can highly recommend these. They are very sturdy and last a very long time. Rated 2 out of 5 by wordpainter from not so good hamper this laundry hamper is too deep ...I do not have monkey arms so reaching the bottom is difficult... it is not wide enough..this is obvious in how it falls over if I look at it sideways. I had a Rubbermaid for 15 years..that was a fantastic wheeled hamper..wide enough without being too deep. . unfortunately they no longer make that lovely hamper so I am stuck with this. Rated 5 out of 5 by Jamie from Like that it's wheeled Great product just wish they sold replacement wheels. Rated 5 out of 5 by Michael from Great product The Sterilite products are great - bought this wheeled hamper to replace my previous Sterilite hamper after 20+ years of service. Yes, twenty years. Great product, good quality, and value for your money. Rated 5 out of 5 by sparkfan1965 from Great investment I purchased my first Ultra Wheeled Hamper about 4 years ago and I love it. When we moved and got a second bathroom, I purchased another. Makes doing laundry so much easier.